Do you know the mascots for Rice Krispies by name? I didn't. Now I do. Now you know too. Poor Pop--not only is he always named last, but he's also forced to look like some sort of silly train conductor. I also didn't know they had their names on their hats. Doh. Moving on. I found some stale-ish once-crispy rice cereal at work and swiped it before it got tossed into the trash--I knew I could put it to good use. Waste not, want not, right? 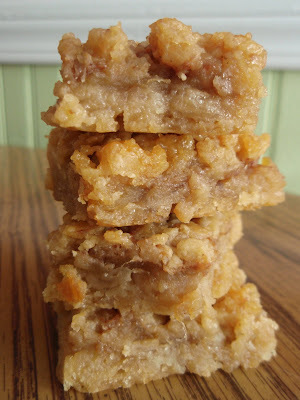 I found a flexible recipe for some cereal bars and tweaked it to my heart's content. It called for pie filling, but all I had on hand was some delightful chunky applesauce that I thought would be a suitable replacement, and it was. Also, there were no spices in the recipe, and that's just a travesty. Guess which spice I added. These bars were pretty soft, and I'm sure that has a lot to do with my decision to replace corn syrup with caramel sauce. Also, the applesauce wasn't as thick as a pie filling would've been, so that was probably a contributing factor as well. No matter, this dessert was still quite tasty. Apples and cinnamon and caramel tend to be like that. In a large mixing bowl, combine cereal, flour, sugar, margarine, and caramel sauce. Remove 1 cup mixture and set aside for topping. Press remaining cereal mixture evenly and firmly in bottom of 9 x 9 x 2-inch baking pan coated with cooking spray. Bake at 350°F for about 15 minutes or until light golden brown. Remove from oven and spread apples over hot crust. Sprinkle evenly with cinnamon and remaining cereal mixture. Return to the oven and bake 20 minutes longer. Cool completely in pan on wire rack before cutting into bars. I will also never think of Rice Krispies the same after that one family guy episode where they go after the Keebler Elves. you are so clever! great rescue work. these look heavenly! What a great recovery!! They certainly look delish! Yay for apples! ...and I always love you for saving food from waste. These look a whole lot better than standard rice krispie bars which are way too sticky for my teeth! And of course you had to add cinnamon. What fun would dessert be without it? What an interesting take on rice crispy bars! 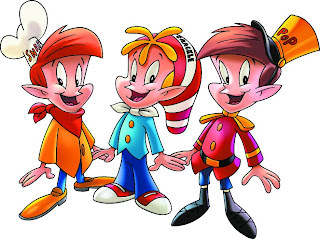 I never knew which was which among snap, crackle, and pop or that their names were on their hats! Pop is clearly underrated. Oh Grace you may have saved me! I've got my sister's and coworker's b-days and a serious urge to bake. Ben's diet has put a huge dent in my culinary creativity. I was waffling between Prudy's apple bars and oatmeal scotchies or krispie treats--and I think you found the perfect combo! Rice Krispie Treats are one of my favorite snacks - I think it's because I'm instantly jetted back to elementary school. These look great! Now that's a different take on the Rice Krispie treat!! Yum! Nice looking Streusel Bars. I admire your "waste not, want not" creativity! Apples and cinnamon ... yum! Not a huge rice krispie bar fan, but these? Oh, yes please. Perfect with my morning coffee. Geez I seem to say that alot about your tasty baked goods! "Poor Pop--not only is he always named last, but he's also forced to look like some sort of silly train conductor." I'm still laughing hysterically at this. Ever wonder why some things just strike you as so darn funny? Culinary genius - in my book. Who else could create such a masterpiece from stale rice krispies? Maybe I'm old but I used to have Snap, Crackle and Pop dolls when I was a kid! Yum! Such a good twist on the traditional treat recipe! I'll have to try them! mmmmm..look pretty darn good to me!!! Apples and Caramel!! It has to be a winner. Good ol' Snap, krackle, and Pop. I've made and eaten more rice crispie treats than I care to mention. This is much more sophisticated. I'll have to give it a try. looks rich and delicious - my style of dessert! Simple ingredients for a yummy looking bar! I have to try this. Mmmmmmmmmmmm, a little soft AND a little crunchy. Looks delicious! Grace you did a darn good job with these,just look what you created with stale rice krispies!! Now this is an apple dessert I would be more than happy to try. A great idea for those aging rice krispys. They don't have time to get old in my house with the kids! Yep, my kids tell me all the time! These look flippin' amazing! Oooh, and I just made a great big batch of apple butter! It would be great in this, it's thick and creamy and yes, cinnamony! Thanks for the recipe Grace! Grace, your ingenuity amazes me! Those look great but I'm shocked that a dessert recipe calls for no spices! mmmmm some of my favorite ingredients are apples...caramel...and cinnamon! Speaking of stale rice krispies... I've got some of my own, lol. I might have to transform them into something delish like yours. Nice work! Yes!! You make the best bars in the world. Caramel syrup is SO good. Good on you Grace! Saving the environment by not wasting - you're an echo warrior (a clever cooking one! Hehe). You're impressive! I never would have thought of making anything other than rice crispy treats. I'm try to get be more daring but I obviously have a long way to go. Your bars look delish. I love when they are ooey and gooey! Hey, it's okay to add ya to my blogroll? THX! Oh, I love those! 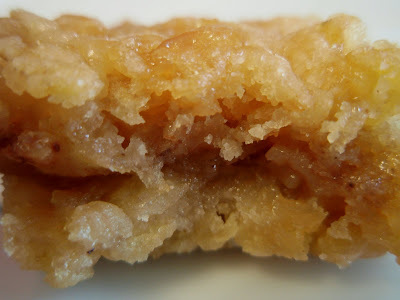 I just made Vanilla Sugar's amped up krispy bars this weekend. Now I'm making your apple ones for sure. Apple and caramel make the perfect fall treat! Great idea to jazz up the regular rice crispies! Oh Grace, these look fantastic. I have a sweet tooth right now and I would give anything for one of these tasty bars. Delicious! I thought those looked a little different than the original - YUM! This is the kinda' southern treat that make me wanna smack grandma! It appears 41 others thus far feel the same. Those look so moist and soft and good! Good call with the caramel sauce. Can't go wrong with apples, caramel, and cinnamon. These are yummy! And I love your substitution! you are so creative! these look yummy! I like the addition of the caramel sauce and the other changes. Your dish definitely beats that standard marshmallow rice crispy treats. I agree with albany Jane about the FG episode. "Those freaking elves man...they just came out of the trees"
That's a great idea for not wasting almost stale-ish rice cereals! Sadly I actually did know that they had names...weird. Still in my brain after all these years. Good for you for replacing the corn syrup with caramel! Yum! Holy cow! You've done right by pop, crackle and snap! Picture me, reading your story, and then I get to the part where you casually drop the comment that you added caramel sauce. I'm pretty sure I made a yummy noise at that point! These sound great and your photos are terrific! OMG! I have to try this!!! Waste not want not indeed! I'm glad to know I've got a friend who uses old food that anyone else would think was nasty or rotten or old and turns it into a treasure! I can't say no to any sort of spicey apple creation! spice and oats cookies w/ the rasberry jam that you posted on 1/2/08? you had a link in the post and that blog is no longer available. i have some sour cherry jam that i think would be delicious in them. thanks. I am so loving the idea of these. I think I need a trip to the store. I'm SO gonna make these!!! I just made an caramel apple bundt cake...and would've preferred something a little less hassled and not so heavy. It's fruit - so it's healthy! Fantastic. Doncha just love it when something droolworthy comes from a rescue mission? apples, caramel, cinnamon -- Ohhhhh yesssssssss. What a treat, that looks yummy. First of all, these look delicious! I haven't had a rice crispy treat for years, but this looks like a much improved version. Second, a story. When I was a freshman in college our dining hall had some sort of trivia night. They gave away prizes, and what should my roommates and I walk away with but three life size cut-out cardboard figures of the Crack, Snapple, and Pop. We proudly displayed them in our dorm room. These bars look great, anything with rice crispies I enjoy... not to mention applesauce, caramel, a cinnamon! ok now you have me wondering about the other outfits on those kitchen elves, one's a chef, one's a... pirate? and then a conductor..? hmmm. anyways, those do look delicious, wish I had one to go with my cuppa coffee. Oh, those look great! When i was a kid, I had three mice, and i named them Snap, Crackle and pop, lol. "I don't wanna have my face on the cover of a Wheaties box, I wanna have my face on the cover of a Rice Krispies box. Snap, Crackle, Mitch and Pop. 'Hey, how the f*** did he do that??' Hey, in Hollywood, it's all about who you know and I know Crackle." I did in fact know that they had names, but did YOU know that the names are translated in different countries? In South Africa, their Afrikaans counterparts are Klap Knetter & Kraak. And (apparently) in Finland it's Riks, Raks & Roks; in France it's Cric, Crac & Croc; in Germany it's Knisper, Knasper & Knusper; in Sweden it's Piff, Paff & Puff; and in Spain it's Pim, Pum & Pam.